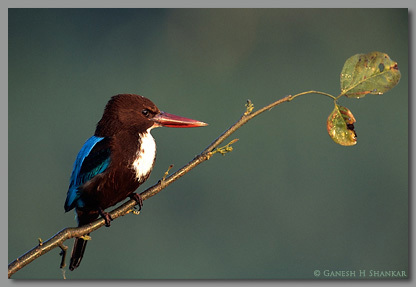 We all love an image of a beautiful bird sitting on a nice perch with clutterless background - don't we ? But then why ? Further, I belive there is a direct correlation between the fact that we like an image v/s how long that image stays in our memory. More we like longer it stays in our memory. According to famous psycologist George Miller If the amount of information in the span of immediate memory is a constant, then the span should be short when the individual items contain a lot of information and the span should be long when the items contain little information. Roughly speaking we human beings have limitation on number of variables that we can handle simultaneously and keep it in our immediate memory. 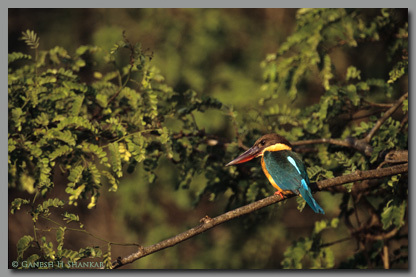 Most of us probably will like the image (White Throated KF) above because compared to the next the image of Stork Billed KF, WTKF has far fewer "states". How many states are there in WTKF image ? uniform background, nice branch, morning glow on the branch, some buds on the branch, couple of leaves, probably ten different tones in the bird - roughly thats it. Compare that to the next image - I will leave it to you to count the number of variables that are there - I am sure it runs into 50+. So our visual system is not very receptive to such an image when asthetics is what makes an image. Then why don't we remember all those nice images of birds on a beautiful perch ? The issue is we see or have seen lots of them. 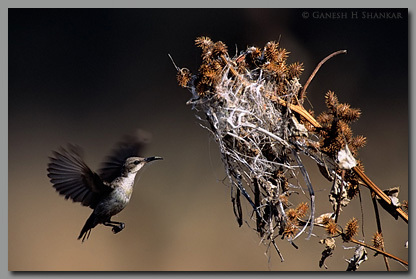 In a typical web forum dedicated to avian photography for example we will see hundreds of such images a month. We all appreciate them when we see that. But they are forgotten at the same rate. Probably we *may* remember some of them if they are made by us -:) because we might have seen them one hundred times - which helps us transfer some them into our long term memory. Then there are images which we remember a little longer. I think that is for couple of reasons - first state-space of those images are slightly less than images like WTKF seen above. Some aspects of the images like in this case helps arrest viewers' eye on the bird so that effective state-space gets reduced. Secondly we are not seeing or making them in large numbers. But my experience has been they too will not be remembered for long. Though their state-space is less compared WTKF image above it is still large enough. Further they are not very unique - most of the time relying more on the "tool's" capability to make such images (eg autofocus speed, frames/sec etc) which is repeatable by others. How do we reduce the state-space further ? There is no easy way. One approach is to capture a story in an image. The image simply goes beyond asthetics - in a very subtle way it touches our senses, conflicts with our accepted value system, brings out sociological issues etc. 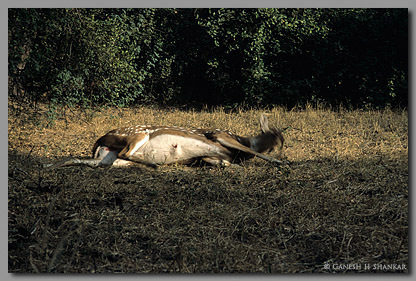 As an example look the image of a deer which was shot at by poachers and is struggling for life. You can see the blood and bullet mark that has pierced through its stomoch. How many states this has ? 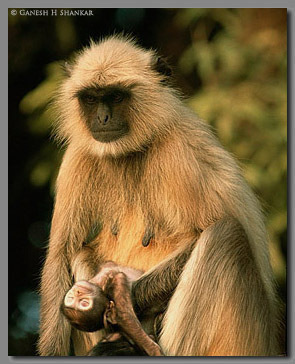 Look at this other image of a langoor carrying its dead baby. I understand in case for some reason the baby dies the mother will keep the dead body till it decomposes. I am sure this and another image of the same mother will stay my memory for years to come. There are scope for asthetic corrections but in my view they become mute in the sense they will not be noticed at all - since the image strongly relates to emotions, our understanding of relation between a mother and a baby. Look at this image made by Kevin Carter At the outset such images may have many states. But actually it has only one state. Image stays only as a pointer to strong emotion, value system, social problem or such. Quickly emotion takes over the image. We need to see them only once to remember them for ever. They may fall short on asthetics (who cares?) but then underlying story is so strong asthetics does not matter. How many such images one can make in her/his life time ? I would guess any where between zero and one. Let the world be better place to live - we don't even need to see such sights. OK, that goes beyond the scope of this article -:) As a closing note, I would think an image will be remembered long if it relates to what is already stored in our long term memory - be it conflicting with our value system, bringing out sociological issues or touching our emotions in some way. Showing such an image to a first grade student will not evoke much feeling or response since not much is there in the long term memory at that young age and the image may not relate to what is already there.